Clete Blakeman's crew bungled one of the worst officiating sequences I've ever seen. Yes, yes, the Philadelphia Eagles deserved to lose on Sunday against the Dallas Cowboys. They were doubled up by Dallas on the stat sheet in yards, first downs, and time of possession. Obviously, you're not going to win many games when that happens. With that disclaimer out of the way, the officiating in that game was the worst I've ever seen in my six years as a full-time beat writer covering the NFL. After getting a closer look at the "coaches film" of the game, there were three calls that stand out as being egregiously awful, and a fourth call that was made for the first time all year, in Week 14. Let's look at all four. • Cowboys kick returner Jourdan Lewis fumbled the ball on the opening kickoff. It was an extremely obvious fumble that was somehow missed on the field. • With the ball on the ground, a crowd of Eagles players jumped on the ball. • The "pile" dissipated in less than 10 seconds, with Kamu Grugier-Hill emerging with the football. It was 100 percent clear that Grugier-Hill recovered the fumble. Every player on the field — Eagles players and Cowboys players — all could clearly see that the Eagles had recovered the ball, based on their respective body languages. Presumably, every official on the field should have seen the same. • Grugier-Hill handed the ball to the officials. • The Eagles obviously challenged the call. Easy overturn. Except, what? The officials ruled that a clear recovery was not made by either team. 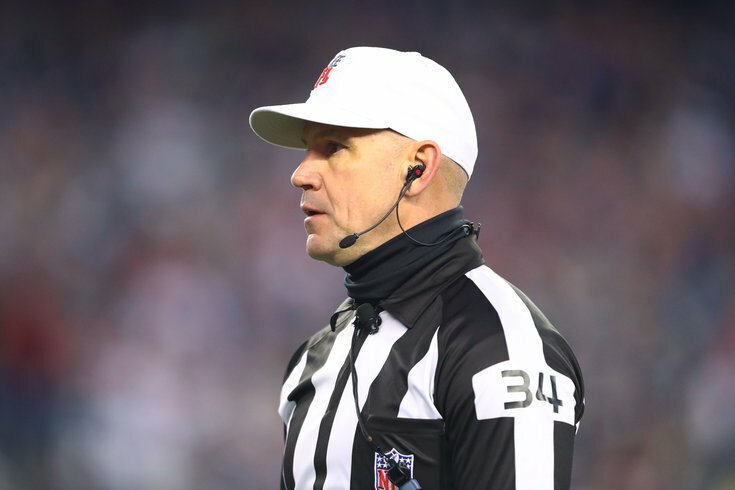 "After reviewing the play, there was a fumble on the play," referee Clete Blakeman stated. "However, we do not have a clear recovery by the kicking team. Therefore the ruling on the field stands as called. First down." Prior to the announcement, FOX officiating expert Mike Pereira noted the parameters for a "clear recovery." "There are two ways that you can have a clear recovery," he said. "One being if you actually see Philadelphia with the ball, and then if the other is if all the guys in the pile are on the same team." A player coming out of a pile with the ball is not a clear recovery. If the players piled on the ball are all from the same team, then it is a clear recovery. As shown above, all the players in the "pile," if you'd even call it that, were Eagles players, with no Cowboys players in any kind of reasonable position to recover the football. But also, video clearly shows Grugier-Hill grabbing -- and then cradling -- the football. • In the end, the Cowboys retained possession of the ball, and the Eagles lost both a time out and a challenge. The ruling drastically altered the entire complexion of the game, and compromised everything that occurred after it. • As of Wednesday morning, the NFL has not yet addressed this egregious officiating debacle. There's an argument to be made that offensive pass interference isn't called enough in the NFL. Receivers routinely — and blatantly — push off while the ball is in the air, with no flags. At a minimum, it is enforced far less often than defensive pass interference. On the 2018 season, there have been 195 defensive pass interference calls, 189 defensive holding calls, and 36 illegal contact call. That's a total of 420 infractions against defensive players trying to cover receivers. Conversely, there have been only 70 offensive pass interference calls. Nothing that Goedert did on his 75-yard touchdown catch-and-run could be considered anything remotely close to offensive pass interference. Worse, there's a strong argument to be made that Jeff Heath (38) could have been penalized for initiating helmet-to-helmet contact with Goedert, and Xavier Woods (25) clearly should have been flagged for an egregious helmet-to-helmet hit on a defenseless receiver. How the officials looked at this play and came away with offensive pass interference (and offensive pass interference only) is mind-boggling. With 43 seconds left on the clock on the Cowboys' final drive, Dak Prescott completed a pass to Blake Jarwin for 7 yards. Jarwin was tackled in bounds, but the clock was stopped at 35 seconds due to a flag that was thrown. Blakeman then announced that the flag had been picked up, the officials then re-spotted the ball, and the Cowboys were able to get their next play off with with 33 seconds left on the clock. The flag was undoubtedly thrown on LG Xavier Su'a-Filo, who flat-out tackled DT Treyvon Hester. Missed holds happen all the time. However, for this flag to have been picked up, a second official had to have lobbied hard against it, saying that a hold did not occur. Who could possibly look at the above play and emphatically disagree that Su'a-Filo outright tackled an Eagles defender? Worse, the picked-up flag essentially gave the Cowboys a free timeout. Instead of 1st and 20 at the Dallas 33, the Cowboys were given a 2nd and 3 at the 50. The difference in those two situations is enormous. Ultimately, Dallas got as far as the Eagles' 41 yard line (well within field goal range) with a timeout in their pocket and 21 seconds left, but a bad snap and a sack on the ensuing two plays ended the threat and the game went to overtime. Still, the flag that was picked up by the officials nearly gifted Dallas the game in regulation. Early in the fourth quarter, Elliott was flagged for lowering his helmet and initiating contact. It was absolutely the correct call, based on the way the NFL explained the rule prior to the season. However, it was the first time that call had been made all season on an offensive player, showing a complete lack of consistency. As noted above, the NFL has not yet commented on the officiating in this game. They need to.